The Chemical Engineering Journal is an international research journal and invites contributions of original and novel fundamental research. The journal aims to provide an international forum for the presentation of original fundamental research, interpretative reviews and discussion of new developments in chemical engineering. Papers which describe novel theory and its application to practice are welcome, as are those which illustrate the transfer of techniques from other disciplines. Reports of carefully executed experimental work, which is soundly interpreted are also welcome. The overall focus is on original and rigorous research results which have generic significance. Within the Chemical Engineering Journal, the Environmental Chemical Engineering section presents papers dealing with topics in environmental chemical and process engineering. Treatment and environmental separation processes, pollution control and resources recovery, environmental bioprocesses, bioenergy, environmental nanotechnology, clean process technology and waste minimization include the topics which are covered. Papers in which knowledge from other disciplines is integrated with chemical engineering are especially welcome. Within the Chemical Engineering Journal, the Chemical Reaction Engineering section presents papers on a wide range of topics including reaction kinetics, applied catalysis, simulation and optimization of different types of reactors, unsteady-state reactors, multiphase reactors, and process intensification including fundamental investigations of the processes of heat, mass and momentum transfer that take place along with chemical reactions. Innovative research works addressing critical areas of reactor engineering (e.g. catalysis, novel reactor designs and materials, reactor safety and environmental issues), and emerging reactor technologies (e.g. membrane reactors, chromatographic reactors, unconventional fluidized beds, electrochemical reactors, micro-reactors, photoreactors, fuel-cells, enzymatic reactors, etc.) are particularly welcome. Submissions based entirely on e.g. 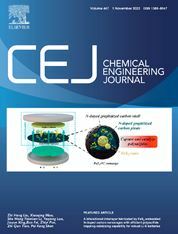 synthesis and characterisation of novel catalytic material, numerical simulations with commercial CFD codes without novel experimental validation; theoretical mathematics, combustion in the context of energy conversion, or straightforward bioreactor applications (bacteria or animal cells) are highly discouraged, as they will find better fit in other existent journals. Within the Chemical Engineering Journal, the Novel Materials for Energy and Advanced Applications section presents papers dealing with different aspects of the preparation and characterization of advanced materials designed for specific applications. This section represents the evolution of the highly successful Materials Synthesis and Processing section whose scope has been redefined to emphasize the design and application of materials in a number of fields, with energy (harvesting, storage, utilization) occupying a prominent but not exclusive role; manuscripts demonstrating applications of novel materials across multiple fields are welcomed. Manuscripts describing novel methods of sythesis as well as the processes used to obtain materials with different morphologies and/or modify the surface and structural properties of those materials will be considered provided the manuscript is written from a chemical engineering point of view. Manuscripts dealing with micro- and nano-structured materials and/or describing the preparation of composite and hybrid materials with advanced properites are particularly welcome. Given the applied character of the CEJ, we will consider manuscripts where specific applications are demonstrated for the materials synthesized. Comments and Proposals: We are interested in receiving comments/feedback on this and our other journals and welcome publication proposals for books, electronic products, new journals and co-operation for existing journals.